On board the service is friendly and relaxed and in the Premium cabin you are served a range of drinks and meals throughout. One of my favourite features was on the touch screen: along with the usual entertainment of movies, TV shows and games they have ‘snack bar’ which allows you to order and pay for drinks and food without moving from the comfort of your seat – when you’re in the middle of movie, it’s always nice to have cold beer delivered to your seat! History Colorado Centre is a museum which you can easily reach by using the city public transport or on a sunny day you can walk the scenic path along the river. This museum is particularly excellent for families with lots of interactive exhibits taking you through the history of Colorado. Avelina was the stand-out restaurant from my whole trip, serving seasonal New American Cuisine. The atmosphere is sophisticated yet relaxed, with laid back but faultless service and extremely knowledgeable waiters. They serve delicious cocktails and craft beers alongside a menu of sharing plates, charcuterie and large plates (the Rohan Duck Breast was favourite for us!). If you’re looking something a bit more casual then Denver Milk Market offers an open space with selection of local dine-in and takeaway restaurants and bars from burgers and tacos to ice cream and craft beer. There are also weekly pop-up events including wine-tasting and live music. 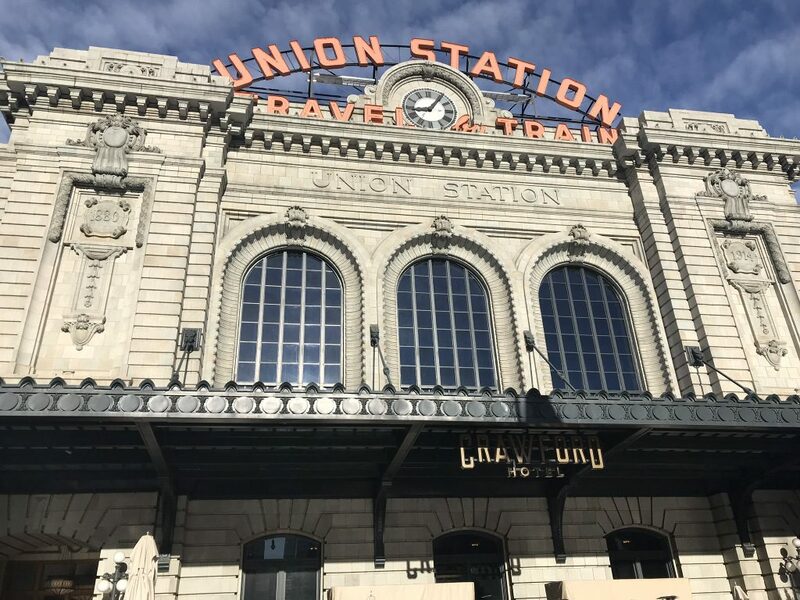 For the beer enthusiasts, Denver is short of a craft beer bar or brewery. 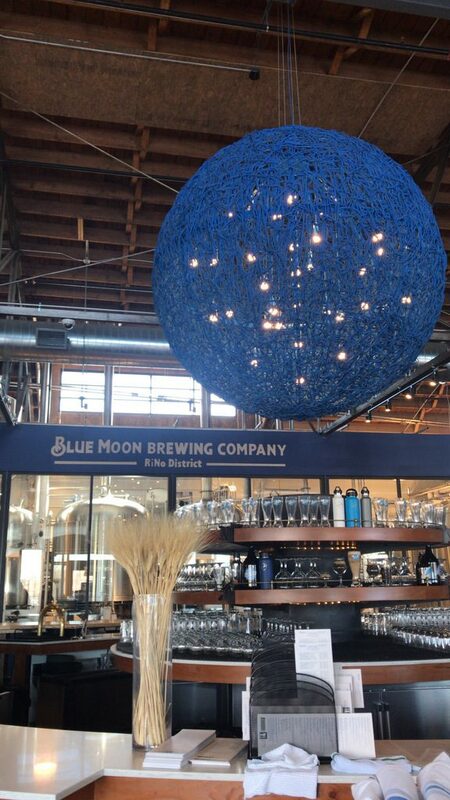 Blue Moon Brewery is about 10 minute drive from the city centre where you can take part in a brewery tour, enjoy the VIP bar with unique beer blends and sit down a pub style lunch afterwards. There are also an abundance of art galleries to visit including Clyfford Still Museum and Denver Art Museum. Ski resort 1 of 3 for this trip was Winter Park which is ideal for families looking for big mountain skiing but still with easy navigation for the children. The ski area is split into seven zones with the lower part of the mountain offering excellent intermediate and beginner terrain and the upper mountain and gladed areas offer more advanced skiing. New this year from the base village is ‘The Gondola’ which surprisingly is a new gondola which whisks you up a lot quicker than the previous Zephyr express lift so even if there’s a queue here in the morning you will be up the mountain in no time and have four different routes to take depending what zone you’re heading for. If you’re looking for exciting gladed forest skiing and pockets of fresh snow even days later then head to Eagle Wind and Vasquez Ridge before heading back over to Lunch Rock to re-energise for the afternoon! After a day of exploring Winter Park, we were up early and off to Steamboat for a couple of days and my new favourite US resort. The ski area is an intermediate’s paradise and with pretty much every run being tree-lined it makes for stunning scenery too. 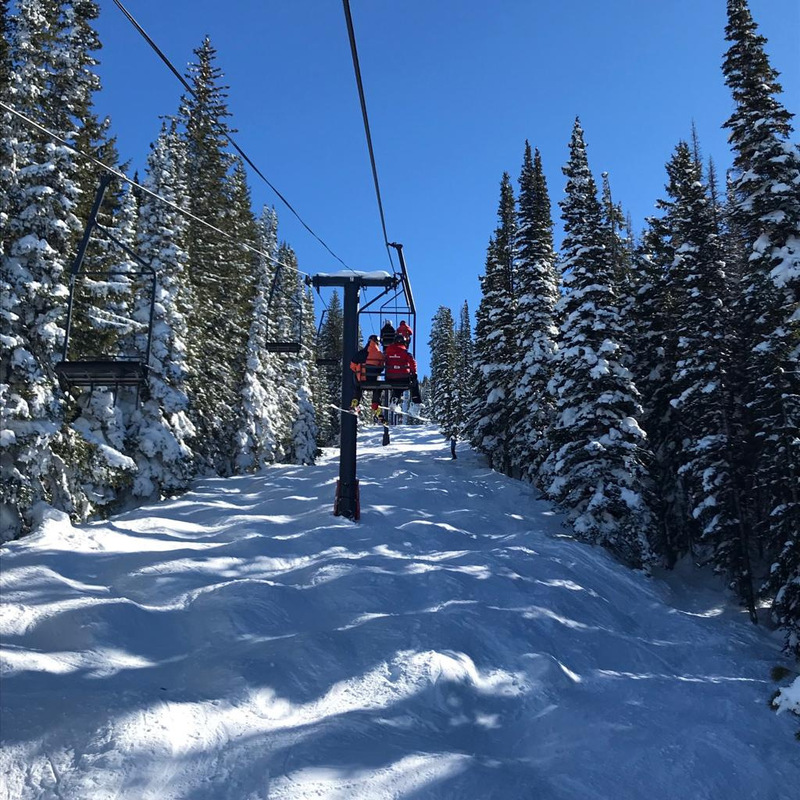 One of our group’s favourite routes was to take the Sundown Express chair up to Sunshine Peak then down One O’Clock or High Noon and connecting with Rolex for an exciting black run down where you will find the Taco Beast* waiting for you at the bottom. 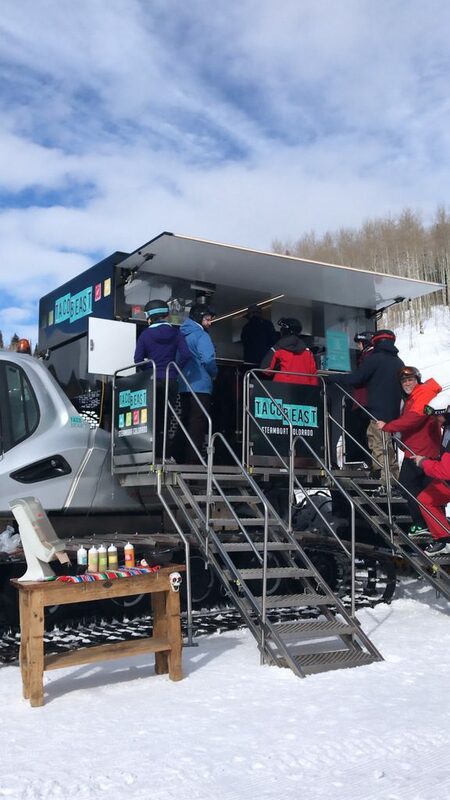 Taco Beast is essentially food truck on the back of snow-cat serving freshly cooked tacos all day in the sunshine (until they run out) and are some of the best I’ve ever had! * The Taco Beast sometimes moves around so it’s not guaranteed to be here. Timber & Torch is a great après spot right at the base of the mountain so can you stumble on in here and have a refreshing drink in hand within minutes. There is also a great dining area in here which was filled with families when we were in and the quality of food was excellent. If you’re in here on a Friday night, you can nip out onto the terrace and watch the weekly fireworks display. 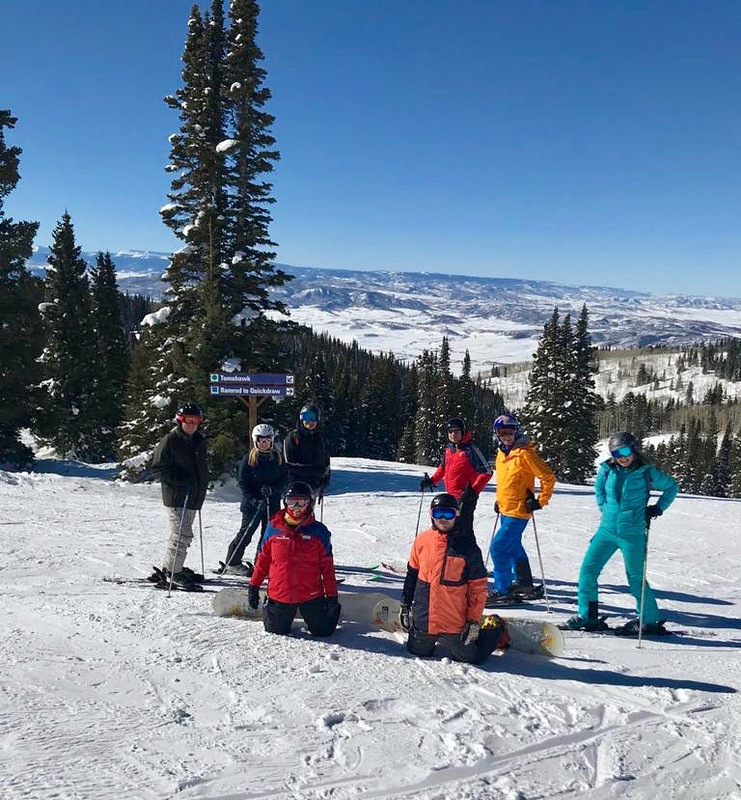 Down in Steamboat Springs town which is a short shuttle ride away you’ll find some excellent restaurants and bars for all group sizes and budgets. Low Country Kitchen was a winner for us where we spent Happy Hour enjoying cocktails, beers and ‘Chicken Biscuits’. Much to all of our surprise a Chicken Biscuit is a piece of breaded chicken inside what I would call a scone (see below) and tasted absolutely fantastic! They also have a full dinner menu featuring Southern Fare which looks very tempting and I’d definitely recommend pre-booking a table here especially at peak times. Our trip ended with a couple of nights in Breckenridge staying at the Doubletree by Hilton which is just across the road and easy ski down to the QuickSilver Super 6 chair lift. Alternatively, you can walk up a little further from the hotel and link in with the Beaver Run Super Chair if you want quicker access to more intermediate and advanced terrain. Fortunately our first day skiing here was the day of the Superbowl so by lunch time the mountain had cleared and we had the chance to get fast laps in over Peaks 10 to Peak 7. 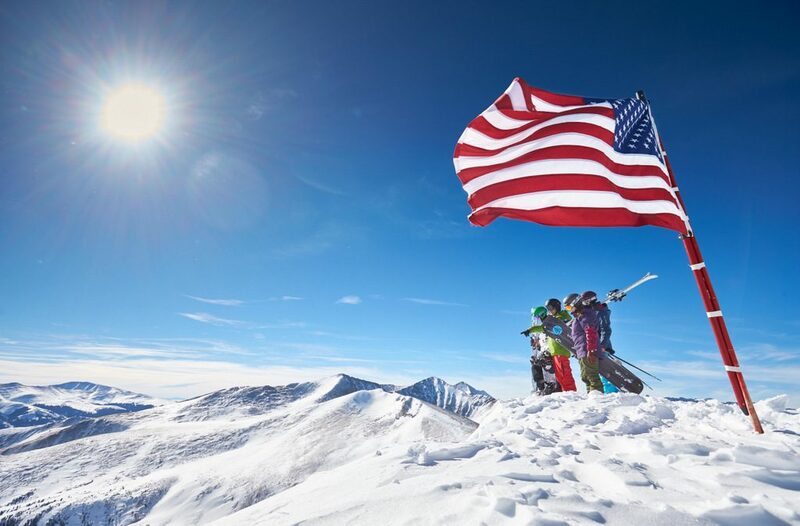 The town of Breckenridge is one of my favourite US ski destinations – with it being an all year round town it has a true American character and Main Street is lined a mixture of traditional bars, a wide selection of restaurants and tonnes of shopping opportunities. We had an excellent evening exploring a few of the popular spots including The Gold Pan Saloon (Breckenridge’s oldest bar), sampling tasters of gin and whisky at the Breckenridge Distillery followed by a delicious dinner at Blue River Bistro. The perfect end to amazing Colorado road trip! If you’re looking to visit more than one destination on your next ski holiday, our multi-centre trips allow you to build your own bespoke itinerary for the adventure of a lifetime. Resorts and city destinations can be linked together in a multitude of ways to create an individually tailored multi-centre holiday. Our team of Ski Specialists have expert knowledge to advise you on what works, and how it can be done in the most effective way. To book a Colorado multi-centre holiday, get in touch today on 0131 243 8097.